On the run in the year 1987, Bumblebee the Autobot seeks refuge in a junkyard in a small California beach town. When Bumblebee is revived, it's found that this is no ordinary yellow Volkswagon. And so begins the newest movie in the Transformers franchise, Transformers Bumblebee. 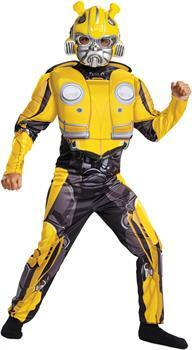 And this is the costume your child is going to need if they want to dress just like their hero! Costume includes Jumpsuit with muscle torso and arms attached 3D back pieces, and soft character headpiece. Fits child sizes 10-12. (C)2013 Hasbro. All Rights Reserved 4-6. (C)2013 Hasbro.